December 13, 2017 -- Sometimes it's hard to come up with a theme for a given RSNA conference, but in 2017 it's easy -- talk of artificial intelligence (AI) dominated the discussion at RSNA 2017. Attendees stuffed lectures on AI to the point where people were turned away from crowded rooms, while vendors took advantage of heightened interest to make claims about AI-powered products that sometimes strained credulity. Presentations on AI ran the gamut, from a talk on how a deep-learning algorithm can assess the likelihood that a lung nodule is malignant to a study on using AI to automatically calculate coronary artery calcium (CAC) scores from CT lung screening exams. The elephant in the room, of course, is whether AI will take away jobs from radiologists, but most experts believe it will act as a tool serving radiologists rather than a master displacing them from work. As in past meetings, other major clinical topics included digital breast tomosynthesis (DBT), especially the use of DBT for breast cancer screening, and gadolinium deposition from MRI contrast agents. And augmented radiology -- the merging of medical imaging with tools such as virtual reality -- is also starting to show promise. The following article reviews the major clinical trends at RSNA 2017. We enjoyed bringing you our coverage of this year's show; be sure to check our RADCast @ RSNA for all of our reports. Artificial intelligence was undoubtedly the dominant story at RSNA 2017, driven by massive attendee interest, a dizzying pace of algorithm development by researchers, and a surge in commercial activity. Just how big was AI at RSNA 2017? If you wanted to get a seat at an AI-oriented scientific session, you had to get there well beforehand. At at least one refresher course, late arrivals were unable to get in the room at all. AI was also seemingly omnipresent in the exhibit halls -- not just in the RSNA's popular new Machine Learning Showcase but also in booths large and small around McCormick Place. With all of the hype over the past couple of years, it can be easy to forget that it's still early days for AI in radiology. In a positive development, the widespread initial fear that AI would displace radiologists has generally faded amidst growing awareness of how the technology could yield practical and crucial benefits to radiologists, the practice of radiology, and patient care. 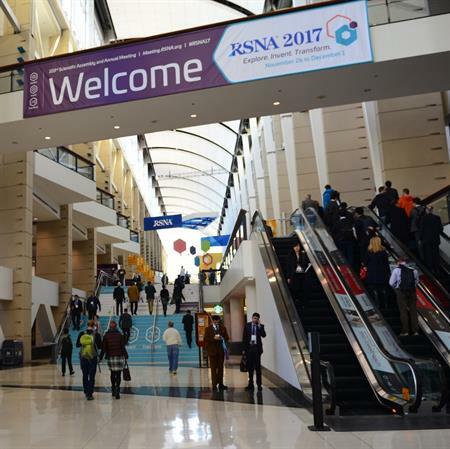 Indeed, AI's potential was fully evident at RSNA 2017 in the more than 100 AI-oriented scientific presentations and refresher courses. Researchers traveled to Chicago from around the world to share their progress in developing AI algorithms for a wide variety of clinical applications, including improving the care of stroke patients, finding and classifying the risk of lung nodules, and identifying imaging cases that need priority review by a radiologist. In addition, a number of presentations showed how deep learning can play a significant role in facilitating radiomics, such as using quantitative image features to predict the KRAS mutation status of tumors in metastatic colon cancer patients and to forecast patient survival for a number of different cancers. AI also continues to demonstrate prowess for speeding up workflow by handling cumbersome -- but clinically valuable -- tasks such as automatically quantifying coronary artery calcium on CT lung cancer screening exams. What's more, AI may be able to improve radiologist performance for imaging studies such as screening mammography exams. Radiologists might find it difficult to trust a deep-learning algorithm that doesn't share any information about how it arrived at its diagnosis, but software that can show "heat maps" could build confidence in its findings, according to another talk at RSNA 2017. The potential to achieve equivalent or perhaps even superior diagnostic performance to radiologists has undoubtedly been a driving force behind the elevated interest in AI -- and likely much of the venture capital and investment flowing to AI firms now targeting this space. Importantly, however, commercial momentum is beginning to pick up for pursuing more-practical and less-controversial use cases for AI in radiology. At RSNA 2017, vendors notably showed a growing interest in targeting AI's sweet spot: addressing the pain points that introduce inefficiency and variability in radiology, said Dr. Paul Chang from the University of Chicago in a video interview with AuntMinnie.com. "For instance, you're beginning to see people use these technologies appropriately to improve the efficiency and quality of image acquisition, where you're embedding deep-learning systems in the image processing of our acquisition devices of CT and MR," Chang said. "You're beginning to see the application of deep learning and similar kinds of applications and technologies in the overall workflow orchestration. This is a good sign." Mention gadolinium-based contrast agents (GBCAs) and gadolinium retention, and clinicians immediately take notice. Capitalizing on the demand for more information, the RSNA hosted an open forum for the second year in a row on the controversial topic of the safety of GBCAs. "This is a very controversial issue, especially between the U.S. and Europe," commented Dr. Alexander Radbruch, a radiologist at Heidelberg University in Germany and a leading GBCA researcher. In his presentation to some 300 attendees at RSNA 2017, Radbruch noted the difference between the regulatory approaches to GBCAs. The European Medicines Agency's (EMA) Pharmacovigilance Risk Assessment Committee (PRAC) has ruled that several gadolinium-based agents be pulled from the market, while the U.S. Food and Drug Administration's (FDA) Medical Imaging Drugs Advisory Committee (MIDAC) opted to revise the prescribing information for GBCAs to include a warning about gadolinium retention in certain organs and tissues. Much of the debate continues to focus on whether the MRI contrast agent of choice should be linear or macrocyclic. Radbruch cited a March 2017 study that reported a trend away from the use of linear GBCAs toward macrocyclic GBCAs, at least among pediatric patients, as a potential glimpse at the horizon. "What does the future bring? I think the markets will decide it for themselves," he said. "My personal opinion is that the preferential use of macrocyclic agents could finally end this debate." In the meantime, Dr. Robert McDonald, PhD, a neuroradiologist at the Mayo Clinic in Rochester, MN, and a featured speaker at the forum, offered evidence on the safety of GBCAs with a first-of-its-kind study. He and his colleagues found that gadolinium accumulation does not degrade a person's overall neurologic or neurocognitive performance, nor does it significantly affect the natural progression of cognitive decline. 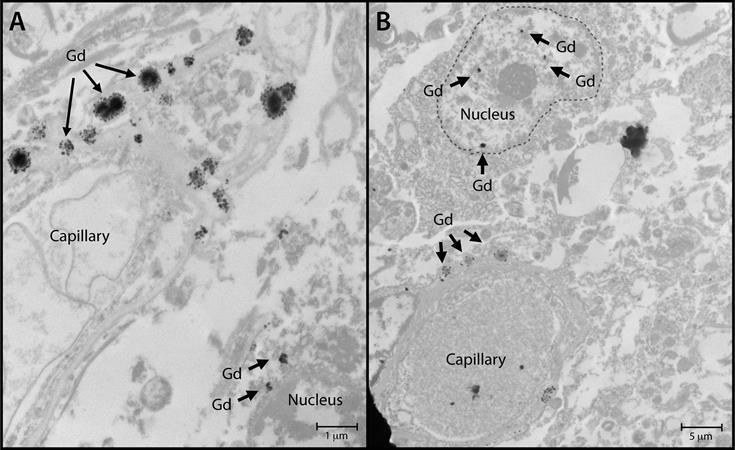 An image showing gadolinium deposits from a study by McDonald et al presented at RSNA 2017. Image courtesy of RSNA. "This study provides useful data that at reasonable doses [of a GBCA] 95% of the population is likely to receive in their lifetime, there is no evidence at this point that gadolinium retention in the brain is associated with adverse clinical outcomes," McDonald said. That perspective, of course, begs the following question: What about the other 5% of patients who receive more excessive amounts of a GBCA? Naturally, the well-being of patients is the primary goal for all radiologists and clinicians. "The current thinking is that there is a desire among the patient community for education regarding this issue," said Dr. Karen Bleich, a medical officer in the FDA's Division of Medical Imaging Products (DMIP), during the forum. "The thinking is that there will be a patient guide developed, which will be dispensed at the point of care, imaging centers, and radiology suites." And the more information that radiologists, clinicians, and patients have, the better their decisions can be regarding the risks and benefits of GBCAs. 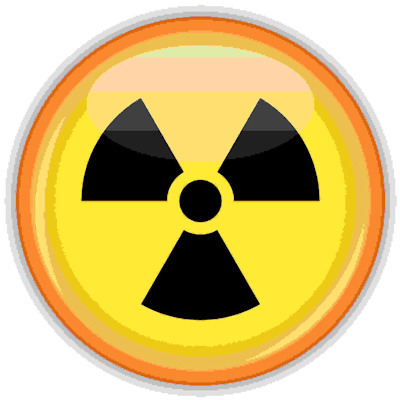 Radiation safety has consistently held its ground as a top priority for radiologists in recent years, and this theme rang true at RSNA 2017. Public concern over excess radiation exposure has motivated radiologists to push the boundaries in terms of finding ways to lower the radiation dose required to spot signs and symptoms of disease. In one example, South Korean researchers in a systematic review confirmed that diagnostic accuracy for appendicitis is now as high on low-dose CT scans as it is on standard-dose CT scans for radiologists at their hospital. To propel radiation dose optimization even further, researchers have been incorporating new technologies into existing techniques. A large number of scientific presentations at RSNA 2017 centered on the power of iterative reconstruction to optimize radiation dose by minimizing image noise and enhancing image quality, including for coronary CT angiography and dual-energy CT. Researchers discussed additional methods to achieve adequate image quality with ultralow doses of radiation, such as by using organ dose modulation, protocol modification, and metal artifact reduction techniques. A highlight appeared to be advances in ultrahigh-resolution photon-counting detector CT for ever-lower radiation dose. Attendance at related physics sessions was notably high this year. Impressive gains in artificial intelligence have also found their way into radiation dose management. A group from Stanford University used a deep-learning algorithm to reconstruct PET images of up-to-par image quality with a 100-fold dose reduction. The radiation dose from scans acquired with this technique is comparable to the minor amounts that airline passengers are exposed to when taking a flight from Los Angeles to New York. Another team, this time from the Illinois Institute of Technology, demonstrated how its convolutional neural network (CNN) algorithm was able to create "virtual" high-dose CT scans from microdose CT scans in 20 seconds using only 0.2 mSv, which would make screening with microdose CT much more viable, according to principal investigator Kenji Suzuki, PhD. Approaching radiation dose management from a different angle, several groups presented ways to monitor and report radiation dose as well as limit variation. In one notable study, researchers from the Einstein Healthcare Network set up a radiation dose optimization committee, standardized protocols, and used dose-modulating scanner software to lower radiation dose variability throughout their entire network. "Just as important [as lowering radiation dose] for specific patients is the probability or the likelihood that they will actually get that low dose," Dr. Ryan Lee told attendees at RSNA 2017. Technology is increasingly interweaving with the field of radiology. New research at this year's meeting has highlighted considerable progress in deep learning, iterative reconstruction, and the imaging devices themselves. And as technology tirelessly marches onward, so too, it seems, does the push for improved patient safety and radiation dose management. Radiology has long been at the helm of medicine when it comes to integrating new technology into healthcare. 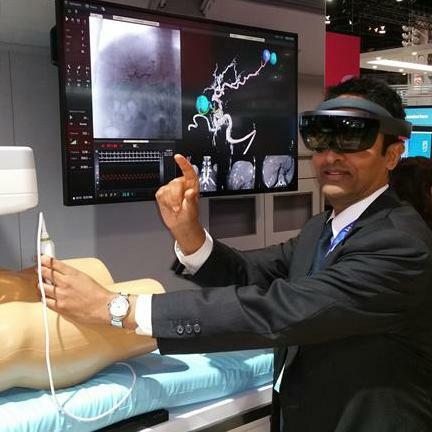 And with augmented reality (AR) all over the map this year -- especially in the gaming and entertainment industries -- it's no big surprise that the budding technology was a hot topic at RSNA 2017. "The increasing commercial and entertainment demand for augmented and virtual reality presents us with the opportunity to completely rethink our image interpretation environment," Dr. Eliot Siegel from the University of Maryland told AuntMinnie.com. Unlike the fully immersive world of virtual reality (VR), AR adds virtual 3D objects, or holograms, as an overlay within a real-world setting -- allowing users to place 3D images at a particular place and move them around in real-time. "We can create a virtual set of monitors and other paradigms for image display without the constraints of room size, brightness, or location," Siegel explained in his Virtual Reality in the Reading Room refresher course. "This will result in fundamental and important changes in the practice of diagnostic and interventional radiology." RSNA 2017 attendees saw firsthand the way AR could function in the clinical setting during an opening lecture by Dr. Roderic Pettigrew, PhD, former director of the U.S. National Institute of Biomedical Imaging and Bioengineering (NIBIB). Pettigrew pointed to a video in which a gastrointestinal surgeon in London used a form of AR called "mixed reality" to collaborate virtually with a radiologist in Mumbai, India, and then with a scientist in Atlanta, with the remote doctors represented as avatars in a virtual surgical suite. Several exhibits and posters at RSNA 2017 similarly demonstrated potential uses of augmented reality based on MR and CT scans, such as for guiding the surgical planning of ear canal or abdominal surgeries. In this respect, the utility of AR resembles the use of 3D printing for preoperative visualization. In a scientific session, researchers from the University of California, Irvine displayed their mobile, online, open-access AR and VR educational platform. After testing its effectiveness with medical students, residents, and radiologists at RSNA 2016, they presented results at this year's meeting showing that using the platform led to statistically significant increases in confidence for identifying normal and abnormal structures, as well as increased accuracy of diagnosis. Several vendors demonstrated augmented reality projects at RSNA 2017. RSNA attendees interested in testing augmented reality in person had plenty of opportunities to do so at various exhibits. At the Philips booth, visitors could sport a Microsoft HoloLens virtual reality headset to see a heads-up display of 3D images and voice-automated tools in an AR concept display. Exemplifying RSNA President Dr. Richard Ehman's call at the RSNA 2017 opening session to "explore, invest, and transform," augmented reality appears to be a prospective reality in radiology. At this year's RSNA meeting, the imaging revolution that is digital breast tomosynthesis continued, with researchers exploring all the technology can do for breast cancer screening. "DBT continues to be shown to be the new, better mammogram, as additional data demonstrates the improved screening outcomes at both the patient and population levels," Dr. Emily Conant, chief of the division of breast imaging at the University of Pennsylvania, told AuntMinnie.com. Conant facilitated a DBT session and contributed to research that was presented at the meeting. Swedish researchers added evidence to Conant's assertion, presenting results from a DBT screening study that included almost 15,000 women. A group led by Dr. Sophia Zackrisson of Lund University in Malmö found that breast cancer screening using one-view DBT and reduced compression increased cancer detection over digital mammography alone, with a reasonable recall rate: DBT found 8.7 cancers per 1,000 women with a recall rate of 3.6%, while 2D mammography found 6.5 per 1,000 with a recall rate of 2.5%. "Our results show that DBT as a standalone screening modality is feasible," Zackrisson said. "And the reduced compression force represents a further benefit that may encourage more women to attend screening." Stateside, Yale researchers found that DBT screening detects smaller cancers than digital mammography (1.4 cm versus 1.8 cm) and those with fewer positive axillary lymph nodes (15% versus 31%). These kinds of results could lead to improved clinical outcomes, according to presenter Dr. Maryam Etesami. In another study, Etesami and colleagues found that recall rates of DBT screening remain sustainably low over time, despite an initial spike when the technology is implemented. 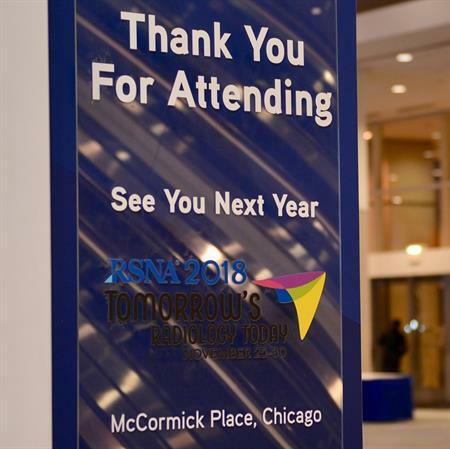 RSNA 2018 will take place November 25-29, 2018. Also part of the screening DBT discussion was the use of synthesized 2D images with the technology, exploring how they perform in a screening program. Dr. Francesca Caumo of the Centro di Prevenzione Senologica in Verona, Italy, and colleagues found that DBT plus synthesized 2D images outperformed regular 2D mammography in terms of cancer detection rate (9.78 per 1,000 patients, compared with 5.34 per 1,000 patients) and identified more and smaller invasive cancers. Based on the results, the group concluded that DBT plus synthesized 2D can be used safely in a screening program and offers women the benefit of less radiation exposure. There were cautionary tales as well, however: Dr. Yi-Chen Lai of Taipei Medical University in Taiwan and colleagues found that synthesized 2D exams used with DBT appear to have reduced sensitivity for identifying calcifications, warranting perhaps the continued use of traditional 2D mammography. In any case, with DBT's screening benefits -- its ability to find smaller cancers, its effectiveness in women of all ages and breast densities, and its sustainable recall rates -- excitement about the technology remains high, Conant noted. "Data shows that on a patient level and population level, screening outcomes are improved with digital breast tomosynthesis," she said.